The 1945 Washington Senators1 intrigued war-weary baseball fans with an improbable pennant run. The team’s success stemmed largely from a unique pitching staff, dominated by four knuckleballers. The top performer was Roger Wolff, a journeyman right-hander who led the team with a career-high 20 wins. The second of ten children born to Leo and Eleanor (Schifferdecker) Wolff, Roger arrived on April 10, 1911. The family resided in the rural farm community of Evansville, Illinois, south of St. Louis. Census information from 1930 traced the Wolff family lineage back to France. As one might surmise from the German name, Leo’s father was born in the Alsace region. The prospect reported to Danville, Illinois in 1930, going 4-5 with a 4.98 ERA in the Three-I League (Class B). It was the start of an arduous 12-season trek through the hinterlands of the lower minor leagues in Depression-era America. Assigned to the Mississippi Valley League (Class D) in 1931, Wolff’s 15-9 record led the Keokuk Indians to a first-place finish. During the tough economic times, teams (or even leagues) regularly folded. Wolff saw action with four different clubs in 1932; his itinerary ranged from Single-A Denver (where his knuckler wouldn’t break in the thin air) to AA Indianapolis, before wrapping up in Class B with Springfield and Terre Haute. Wolff’s combined season record was 5-5 in 20 games. His 1933 assignments included a 1-1 mark in Class A with Fort Worth, followed by an 8-7 record at Class C Dayton. Returning to Dayton in 1934, Wolff improved significantly to 17-12, accompanied by a 3.84 ERA. Wearing the Dayton uniform again in 1935, Wolff finished 14-14, 3.42. A 1936 stint with Davenport in the Western League (Single A) produced an 8-6 record with a stingy 2.31 ERA. Moving to Oklahoma City in the Texas League, Wolff finished the season 3-7, 4.08. The 1936 season was his third in the Brooklyn Dodgers organization. In 1937, Wolff made stops with four teams in three different leagues, with a collective record of 9-11 and a 3.97 ERA. That year he was a Detroit Tigers farmhand. Wolff finished 1938 at 16-11 with a 2.87 ERA, pitching for Cedar Rapids, back in the Three-I league. Returning to Cedar Rapids in 1939, he compiled a fine 15-5 mark with a 3.08 ERA. The Raiders had become an affiliate of the Cleveland Indians that year after being in the Cardinals chain in 1938. The Pearl Harbor attack on December 7, 1941, suddenly thrust the country into war. Washington owner Clark Griffith lobbied President Franklin Roosevelt, seeking a directive allowing baseball to continue. Roosevelt concurred: “I honestly feel it would be best for the country. . .Americans will need to take their minds off work even more than before.”13 He officially issued the “Green Light” letter on January 15, 1942, ensuring the continuation of baseball as essential to the morale of the country. Rosters were systematically depleted during the 1942 season, as volunteers and drafted players left the diamond to serve in the military. Wolff, with bad feet and even worse teeth, was classified 4-F (unfit for active duty). He became a regular starter in 1942 for the last-place Athletics, going 12-15 with a 3.32 ERA. Reading the tea leaves, Early speculated, “Suppose Mr. Griffith buys Roger Wolff from the Athletics? Then I’ll have all the top knucklers in captivity throwing at me. I promise you, if this club ever signs that Wolff, I’m either quitting or getting a raise.”15 Meanwhile, the A’s remained in the AL cellar. Wolff retained his regular spot in their rotation, also pitching 15 times in relief. He contributed a 10-15 record, with a 3.54 ERA. After finishing seventh in 1942, Washington improved to second place in 1943. Thus, Griffith was cautiously optimistic going into the winter meetings in New York. Conferring with his friend Connie Mack on December 13, 1943, the owners agreed to swap starting pitchers. Griffith sent veteran Bobo Newsom to the A’s in an even-up deal for Wolff. 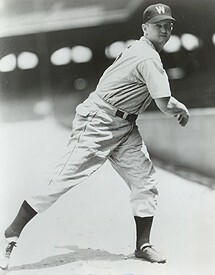 Red Sox player/manager Joe Cronin called Wolff’s knuckler “the best I ever saw.”16 Respected umpire Cal Hubbard considered it unique because it broke upward.17 Despite these accolades, Wolf was often dismayed, because many catchers hated to handle the dancing knuckler and could simply refuse to call for the pitch. Hopes ran high for Washington as spring training 1944 got underway at the University of Maryland in College Park. Commissioner Kenesaw Mountain Landis’s wartime edict, directing all teams to train close to home, remained in effect. The addition of Wolff to the pitching staff seemingly positioned the Senators as legitimate pennant contenders. Despite such optimism, Washington started badly and fell to last place by the end of the season. The Senators played their final home game of 1944 on Saturday, September 16. Wolff pitched seven tough innings in an 11-5 loss to the Boston Red Sox. He ended 1944 at 4-15, with a 4.99 ERA. The downcast pitcher left the park that day thinking about the trade that brought him to Washington. Numbers don’t lie; he was certain that Clark Griffith considered the straight-up deal for Newsom a huge mistake. Wolff was so lost in regret he failed to notice a young fan by his side. Despite not being in the mood, Wolff conducted an impromptu training session while playing catch. Lesson over, he thought about the exchange while en route to his automobile: “Nice kid, maybe he’s got something.”20 Mulling over the discussion, the six-foot hurler, who was listed at 208 pounds, became determined to lose weight and get into shape during the off-season, while practicing his slider. When the Nats returned to the University of Maryland for spring training 1945, a fit and trim Roger Wolff arrived on the scene. He had lost 15 pounds on a vigorous training regimen. Wolff’s three-finger knuckler certainly remained his primary pitch but was accompanied by renewed confidence in his slider. The Senators utilized the Bethesda Naval Base as temporary housing, with limited workouts taking place on the premises. Griffith made a serious judgment error in his zeal to collect extra rent. By uprooting players from their accustomed home base, the move adversely affected a team that legitimately became a pennant contender. Washington finished its 1945 schedule on September 23 with a record of 87-67. The Detroit Tigers were in first place at 86-64. After splitting a doubleheader, the Tigers needed one victory in their remaining two games against the St. Louis Browns. If Detroit lost both games, a single-game playoff against the Senators was scheduled in Detroit, on Monday, October 1. A washout in St. Louis on Saturday, September 29 forced a Sunday doubleheader on a rain-soaked field. Anticipating the possible playoff, the Nats sent Wolff, Leonard, Niggeling, and Ferrell ahead to Detroit. The quartet huddled in the hotel, intently listening to the Sunday game on radio. The rain returned, but it didn’t deter Hank Greenberg from smacking a game-winning grand slam in the ninth inning of the opener, ending any speculation of a playoff. The disappointed Washington players packed their bags and caught the next train to DC. In deference to Wolff’s 20-win season, manager Ossie Bluege named the 35-year-old righty his Opening Day starter for 1946. Post-war rosters began filling with players returning from military service, greatly improving the overall level of play. On April 16, as the Boston Red Sox faced the Senators in DC, Tex Hughson topped Wolff, 6-3. Wolff finished April with a 2-2 record but did not reach .500 again until early June, despite an ERA below 2.00. After that he won just one of his remaining five decisions. On Thursday, July 4, in Washington, Wolff pitched the second game of a doubleheader against the New York Yankees. In the fourth inning, with one out and Joe DiMaggio on first, the Yankees’ Nick Etten hit a tapper fielded by first baseman Mickey Vernon. Vernon threw to shortstop Cecil Travis for a force-out at second, but Travis’ errant throw forced Wolff (covering first) to lean back awkwardly. The pitcher tripped over the base, injuring his back. Ray Scarborough replaced the hurting knuckleballer in the fifth inning. The Nats ultimately lost, 5-0. Wolff was sent to be examined by Griffith’s personal physician, who advised the pitcher not to throw under any circumstances. Griffith disagreed with the prognosis, insisting that Wolff play through the injury. He next appeared on July 19 against Detroit, pitching two innings in relief. At the time, Wolff was approaching the five-year mark of his major-league career, then the minimum amount of time in service needed to qualify for a pension. Not willing to jeopardize his retirement, he acquiesced to Griffith’s orders, boarding a Cleveland-bound train on July 25 to join his teammates. Griffith phoned Bluege, ordering his manager to have Wolff pitch batting practice. Bluege complied, and following the workout, Wolff returned to the hotel in excruciating pain. He was barely able to get out of bed the next morning. Yet Griffith once more countermanded the doctor’s orders, insisting that Wolff continue to pitch through the pain. He was able to appear just once in August and twice in September. With a complete-game victory in his last outing, he finished the season at 5-8, with a respectable 2.58 ERA. Washington ended the season in fourth place at 76-78. The Nats traded Wolff to the Cleveland Indians on March 4, 1947, in a deal that returned speedy outfielder George Case to Washington. In seven games with Cleveland, Wolff recorded no decisions, while posting a 3.94 ERA in 16 innings. The Tribe sold the knuckleballer’s contract to the Pittsburgh Pirates on June 15, 1947; he went 1-4 in 13 games with a bloated 8.70 ERA. After the season, Pittsburgh released Wolff to Sacramento in the Pacific Coast League, but he chose instead to retire. He finished his big-league career with an overall record of 52-69, and a 3.41 ERA. After leaving baseball, Wolff worked as a food broker, sold insurance, and ran a nightclub. He then landed a long-term position as Athletic Director at Southern Illinois Penitentiary (which became known in 1970 as Menard Correctional Center). Invited to participate in numerous old-timers’ games, Wolff decided not to participate in view of his weight (approaching 250 pounds) plus the foot issues from his playing days. He commented, “I’m not gonna get out there and make a fool of myself at my age and condition.”28 Another factor was lingering after-effects from his back injury. Mary Rose Wolff passed away on February 16, 1981; the couple had no children. Roger Wolff was a resident at St. Ann’s Healthcare Center in Chester when he passed away on March 23, 1994, just shy of his 83rd birthday. Thanks to the National Baseball Hall of Fame, for sharing the content of Wolff’s player file. This biography was edited by Rory Costello and fact-checked by David Kritzler. 1 The team’s official name was the Washington Nationals, and thus they were often known as the Nats. 2 Red Smith, “Nats Net Butterfly-Ball Roger Wolff, Who Rambled to Majors on Knuckles,” The Sporting News, December 23, 1943, 7. 3 J.G. Taylor Spink, “From Woeful Wolff to Jolly Roger,” The Sporting News, August 16, 1945, 2. 4 Michael Fedo, One Shining Season (New York: Pharos Books, 1991), 6. 7 L.H. Addington, “In the Bullpen,” The Sporting News, October 30, 1930, 7. 9 “Raiders in Front Ranks,” The Sporting News, January 18, 1940, 7. 13 Ted Leavengood, Clark Griffith, The Old Fox of Washington Baseball (Jefferson, North Carolina: McFarland & Co., 2011), 258-259. 14 Shirley Povich, “This Morning,” The Washington Post, December 15, 1943. 15 Shirley Povich, “This Morning,” The Washington Post, August 23, 1943. 16 Shirley Povich, “This Morning,” The Washington Post, December 15, 1943. 17 “The Old Scout,” clipping from Hall of Fame file, May 1943 (no other identifying information is available). 18 Arthur Daley, “The Man in the Iron Mask,” The New York Times, June 22, 1944. 21 Ted Leavengood, Clark Griffith, The Old Fox of Washington Baseball (North Carolina: McFarland, 2011), 264. 23 Frank (Buck) O’Neill, “Weaker Hitters Best Against Knuckleballers,” The Sporting News, June 14, 1945, 7. 25 “Mexican League Offer,” Tennessee Kingsport News, March 13, 1946, 2. 26 “Dr. Robert Hyland, Baseball Surgeon,” New York Times, December 15, 1950, 31. 29 Fedo, 1. Indeed, Williams was just 6-for-33 (.182) against Wolff in his career, whereas he was 12-for-38 (.316) against Leonard and 16-for-40 (.400) against Niggeling.